2010년, 로테르담 기후 이니셔티브(Rotterdam Climate Initiative : RCI)는 TNO 구축 환경 및 지구과학 분과(Built Environment and Geosciences, TNO)와 네덜란드 북해 해저의 해양지중 CO2저장 지역에서 독립적으로 CO2 저장 평가(Independent Storage Assessment : ISA)를 수행하기 위한 계약을 체결하였다. ISA의 목표는 CCS 프로젝트 개발자들에게 CO2 저장 후보 지역에 대한 활용 가능성, 기술적 타당성, 저장 용량 및 개발 비용에 대해 보다 높은 확실성을 제공하는 것이다. ISA 1단계에서는 2015~2020년 사이에 개발 및 사용될 수 있는 로테르담 인근 해양지중 폐가스전에 대한 CO2 저장 가능성이 조사되었다. 이는 초기 CCS 프로젝트를 지원하는 한편, 더욱 적절한 단기 옵션이 간과되지 않도록 하는 목적을 가지고 있었다. 이후, ISA 2단계에서는 최선의 옵션들에 대해 보다 상세히 연구되었다. 이 보고서의 주제인 ISA 3단계는 이러한 분석을 확장하여 네덜란드의 대용량 해양지중 CO2 저장에 대한 포괄적인 견해를 제공하고자 한다. An Independent CO2 Storage Assessment (ISA) was carried out by TNO to provide CCS project developers in the Netherlands with greater certainty over the availability and costs of prospective offshore CO2 storage sites. This report covers Phase 3 of the ISA and provides a comprehensive overview of Dutch high-capacity offshore CO2 storage reservoirs. 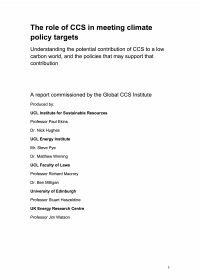 This report contains the steps to be taken in the development of a CO2 storage site, i.e. identification (screening), detailed study and estimation of the cost. This methodology report is considered valuable reading for any organisation that considers proving up storage reservoirs in its particular region.